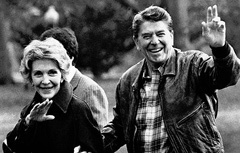 Our 40th president's birthday earlier this month caused me to reflect upon how Ronald Reagan impacted my life. Reporters asked, "Why are you here and why do you like Reagan?" I could not help noticing the baffled looks on their faces upon hearing my reply. "I like Reagan because every time I hear this man speak, I feel good about my country and myself." I later learned that as a black person, I was suppose to hate Reagan. Democrats said Reagan's talk about welfare reform was "code" for his racism and hatred of blacks. As I said, I was young and clueless regarding politics, codes and such. And yet, in my gut, I knew Reagan was a good man. My aunt hated Reagan. She said, "Reagan wants to cut my check!" Even as a non-politically informed person, I noticed my Aunt's bold and arrogant sense of entitlement in her voice when she said, "My check!" Here is a woman who from as far back as I can remember lived in the projects on welfare. I do not ever remember her having a job. In fairness, if my Aunt had a disability which prevented her from working, I never knew of it, as it was not visible. She had five kids and a boyfriend, but no husband. Her daughter got pregnant really early out of wedlock with both the new teen mother and her baby adding to the welfare roll. My Aunt's drug using sons, my cousins, impregnated girls out of wedlock, repeating the welfare government dependency cycle. I overheard my mom commenting to my dad about how her sister practically lived in the Johns Hopkins Hospital Emergency room. At the slightest cough, off my Aunt went with her child to the emergency room. But why shouldn't she? It was free. Over the years, I have grown to have compassion for my Aunt. Our lives are a manifestation of what we believe. Tragically, my Aunt had little or no confidence in her ability to succeed in America. I believe the Democratic Party promoting that America is a racist country and blacks can survive only via democrat legislated government programs contributed to my Aunt's distorted view of her country; the greatest land of opportunity on the planet for all who choose to go for it. I believe you can tell a lot about the character of a person based on how they treat "the little people"; people who can not advance their career or social standing. On TV, a former secret service agent told a great story about Ronald Reagan confirming, in my mind, Reagan's greatness. The agent said he and Reagan had been out horseback riding. Upon their return, Reagan always prepared his horse to be put away. On this occasion, due to Alzheimer's disease, Reagan could not remember the procedure for putting away his horse. The agent felt bad for Reagan and was visibly upset. Reagan feeling compassion for the agent said, "It's OK."